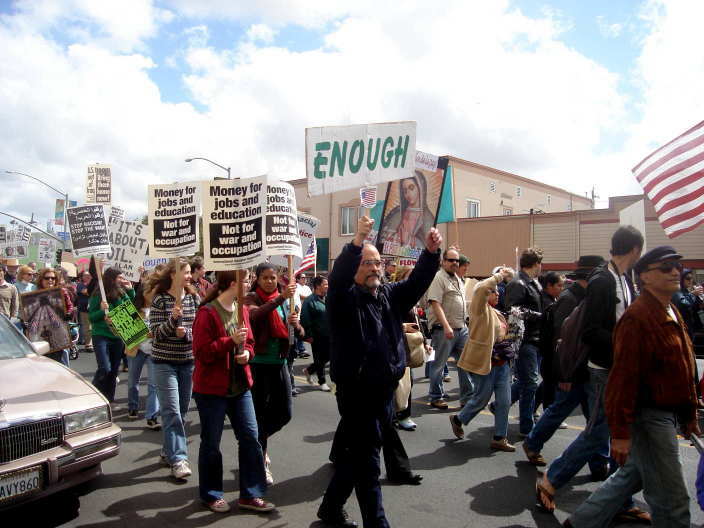 San Diego anti-Iraq war marchers on University Avenue, March 15, 2008. Editor: Iraq’s three-person Presidency Council yesterday approved the security agreement that calls for the withdrawal of U.S. forces, taking the last necessary step for its official adoption. Hayden covers many of the elements of the emerging situation. One he does not mention is the international effort to prosecute Bush regime figures for war crimes and crimes against humanity. Even if Bush pardons people (in advance even, perhaps of any charges being filed) here in the USA, that does not prevent prosecution in courts elsewhere in the world. Prosecution is important for the information it may uncover, for building pressure to check the Obama regime (and future regimes) on its own militarist ambitions by adding very personal risk to the calculations of high level officials, and, of course, for the small measure of justice we might get — for the thousands of US troops killed and maimed and for the MILLIONS of Iraqi and Afghan people killed, maimed or displaced by our government’s illegal aggressions. Convictions, even in foreign courts, could put US war criminals at least under a degree of “house arrest” by making it impossble for them to travel outside the US without risking arrest and imprisonment. And, to the extent we can achieve prosecutions within the US legal system, we have a moral obligation to try. Right on Monty. I couldn’t agree more. They may get away un-impeached but they need be to brought to justice.